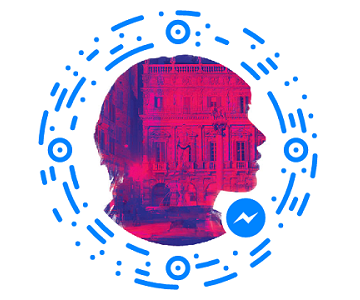 Open your Facebook Messenger app and search for “Juliet_Bot”, or scan the below Messenger code, or click here: m.me/JulietBotSTC to begin talking with her. **UPDATE** I no longer work at the Shakespeare Theatre Company but am glad to report that JULIET_BOT is still going strong after all these years! I work for the Shakespeare Theatre Company in Washington, DC where, reductively, my job is to try and make sure our productions have full audiences. A benefit of the job is that I have the freedom to use my love of interactive media to create experiences to help promote the work. Generally these projects are small in scope as the responsibilities of my job mean that side projects must be completed in my spare time. Not that I mind since I’d be doing this stuff anyway, working for a theatre just gives me a creative base on which I can attach ideas. An important part of heading into a new season of plays is to, of course, read the plays. Our first production of the 2016-2017 Season is William Shakespeare’s Romeo & Juliet, a title I was somewhat dreading revisiting. Even though it had been over a decade since I last read the script I was sure that a return to the work wouldn’t offer any new perspective. For the sake of due diligence, however, I reluctantly dove in. It’s a silly thing to say aloud but from the start I was struck by the power and poetry of Romeo & Juliet. I was immediately reminded of why this work has persisted and pervaded English-speaking culture and at once was eager to process its language anew. Primarily I found new interest in the beginning of the play, a section I had previously glossed over while heading for “the good stuff.” I was struck by the lives of the two star-crossed lovers before they met each other. More than 100 lines are given to Romeo and his cousin’s discussion of Romeo’s obsession with Rosaline, a character we never actually meet. But what about Juliet? All we really get to know is that Juliet’s parents are arranging for her to marry the noble-born Paris. Juliet “gets to” look upon Paris at an upcoming party to see if she could love him. In a brief statement she says that she’ll do her duty only because it’s the will of her parents. That scene stuck with me as I considered what I might do for my next digital audience engagement project. “I’ll look to like, if looking liking move. Shawn Graham of Digital Archaeology doesn’t know it but he has sort of become my digital inspirator, now having inspired two of my projects. The first being a personal project, Guardian of the Blue Light, and now giving me a way to theorize what Juliet might have thought of her situation. Shawn published a simple Facebook Messenger bot using the online platform Sequel and I immediately recognized Sequel as the tool I had been looking for. It could deliver character dialog and, by virtue of being via Facebook, seem like a channel a 14-year-old-girl would use to hold a conversation with a confidant. A few late nights later, I had the beginnings of Juliet_Bot, an interactive scene where you have a short conversation to hear what I suppose what Juliet might have been thinking. It’s casual, imperfect, and I deliberately avoid giving the player many dialog options. I care less about the player’s side and more about letting Juliet vent. I hope you’ll give it a try!